For his 75th birthday, Lalo Schifrin, composer, pianist, conductor and self-described musical chameleon has returned to his jazz roots withÂ the 10-track jazz record Lalo Schifrin & Friends. Featuring jazz legends Alex Acuna, Brian Bromberg, Dennis Budimir, James Moody and James Morrison, Schifrin’s new album is a tribute to life, friends, and above all, jazz. Those unfamiliar with Schifrin’s name are sure toÂ perk up once they hear that he’s the mastermind behind over 100 film scores, including the infamous and unforgettableÂ Mission Impossible theme. Early in his career (in the late 50s) Schifrin began performing throughout the United States and abroadÂ with the legendary Dizzy Gillespie. Thus an illustrious musical career was born. On Lalo Schifrin & Friends, Schifrin spans a wide array of music, from “Tin Tin Daeo,” a Dizzy Gillespie tuneÂ which Schifrin covered to honor his friend and “master,” since he never got the opportunity to play the song with Gillespie himself, to the Schifrin-composed “Winter Landscapes,” which is a bit darker and more resonant than the rest of the upbeat album. Whether you’re a bigÂ jazz fan or not (I’ll admit I’m typically in the latter camp), this album has the rhythm and beauty to keep you entertained and impressed at the same time. There’s a reason Schifrin has had such an expansive musical career, and this album is only a small sampling of that reason. 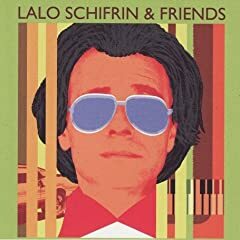 No user commented in " CD Review: Lalo Schifrin & Friends "